As Inca Aroma Studio owner Rika Tazumi celebrates the shop’s eight anniversary this month she is offering a special on a 60-minute deep tissue back oil massage and a shoulder and neck clay pack at a special price of Y5,000. Those who order an additional treatment will get Y1,000 extra discount. The treatment consists of applying aroma oil to the back and then massaging the body using elbows to have a deep effect. Even the stiffest of backs will soften up during this treatment, and as the massage proceeds to the shoulders and head a pure relaxation follows. A clay pack to the shoulders completes the treatment. The pack is made of natural Kaolin clay that contains plenty of minerals. The pack will remove dirt from skin’s pores and makes the skin very smooth. The Kaolin clay pack is also available for the whole back for an extra \500. All treatments are by appointment only, one day in advance if at all possible. The therapeutic deep tissue body oil massages range from ¥3,000 for a half-hour to ¥5,000 for an hour, or ¥7,000 for 90 minutes. Inca is open daily 10 a.m. to 7 p.m. except from Monday through Wednesday from 3 to 7 p.m. they operate at WELLNESS TEACHING CENTER(921-7430) in Sunabe. Inca’s URL is http://inca2.ti-da.net You can also google it by typing Inca Aroma Studio. For more information and make an appointment call 090-1080-0729 or 892-9006. Inca Aroma Studio is located near Futenma Housing. Take Highway 58 to Route 81, heading toward the Camp Foster PX Gate. Inca’s halfway between Highway 58 and the gate. Look for a sign for Italian restaurant Pao. 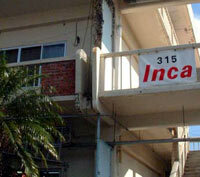 Once Pao is spotted, the red Inca sign is easy to see. Inca is located on the third floor of Taihei Building. Free Parking available.